Generally you will need a permit (or ticket) before you fish anywhere. Finding out where to buy a permit or what beats are available can be a real challenge. We recon the Spinfish Where to Fish Guide will help you a lot. 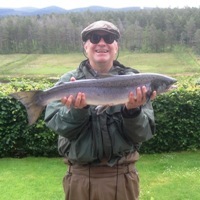 There's about 2500 places listed in Scotland, England, Ireland and Wales in our online Where to Fish Directory. Where to buy permits or tickets, contact details and information about beats and fisheries thoughout the UK, all on line with a Google Map reference. Makes searching for angling opportunities a dawdle. Fished two days with Charlie then I went home after scoring a blank. Shortly after I got this e-mailed to me. I'm not jealous, I'm in the photo too - but I blend into the green backgound just perfectly! Factors Isle on Loch Katrine at Stronachlachar. 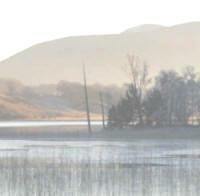 Rob Roy marooned the local laird's factor (estate manager) on that little isle. If he had been taught to fish there's plenty of trout so he wouldn't have starved.